Emily started taking courses throughout high school to get a head start in her career and continues to upgrade her skills taking a course about Ingrown Toe Nail and Bracing techniques. Recently Emily felt that there was a need for more extensive foot care with specialties in ingrown nails, bracing, diabetic footcare. 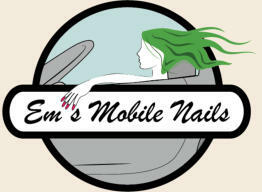 Emily Baillargeon, Owner of Em’s Mobile Nails saw the need for a Mobile Salon Service in the Chatham-Kent area. Growing up with a love of all things nails and makeup she set out to make her passion a rewarding career choice. A graduate from the Esthetician program at St. Clair College here in Chatham she has already earned a solid reputation with many clients. “Senior care is the primary focus of my business,”. “Being able to go to their homes whether they live in an apartment building, retirement home, or hospital means I can come to them and they can still feel pretty.” “It’s important that my clients know that I am Health Board Certified, Fully Licensed in Chatham-Kent, and Ontario which a lot of people don’t realize is required,” reveals Em. “Plus, I have a police check clearance, so seniors can feel safe and secure in their homes.